My life is so exciting. Last week Vegas, this week, Target. I actually like Target much better. So instead of reviewing every boring turn of my day, let's discuss the silly world known as celeberties. Just a few links to follow. Discuss amongst yourselves. What does one say about Johnny Weir except he is FABULOUS! Halle Barry and her partner, Gabriel Aubry appear to be moving to my next of the woods. Great, one more beautiful, skinny woman with money in my zip code. Naomi Campbell has lost her ever loving mind. What is her problem? I find it absolutely ridiculous that this woman is out and about and we even care about her. She is a raving lunatic and doesn't deserve anymore attention or money. Now, this is extra disturbing. Unfortunately, I think this is the beginning of many more headlines for Michael Jackson's children. What a sad state of affairs. Now don't worry, I have read important news events, such as this, and this today. I am, if nothing else, well rounded. On a much more serious note, the world has suffered another tragic earthquake where lives have been lost and people are suffering. Continue to remember those less fortunate and donate. People need money, prayers and thoughts and anything else you can give. For now, here is one foundation I found and researched that are beginning to send help to Chile. As I discover more, I will post the links. Money given to this organization will aid Chile, and Haiti. 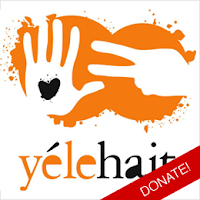 I am also posting the links to the Haiti Donation sites to remind you that they still need help. Anything you can give is a gift: a much needed gift. on kids, food and clean water.